Accentuate your decor with this colourful mosaic mirror, hand made in the UK - add a splash of colour, pattern, texture and interest! 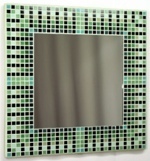 Home Studio crafted, fully tiled and grouted with small vitreous glass mosaic tiles, this mosaic mirror will brighten up your walls, or with the optional stand can decorate your dressing table or other surfaces. It is made from 672 tiles in 8 colours, with a nominal size of 38cm wide x 38cm high (approx 15 x 15 inches) and a 24cm x 24cm mirror. Packing and Delivery to most of the UK is included in the price, with no VAT to pay. Although this shop is for UK customers only, this mosaic design can be shipped to Europe, USA, Canada, Australia and other countries - order online at Egyptian Brown 38cm on Kaamar.com (or if you prefer, use the quote button on the right to ask for a quote). 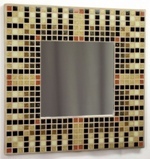 This photo shows the Egyptian Brown 38cm Mosaic Mirror, in the Satin Edged format for wall hanging. 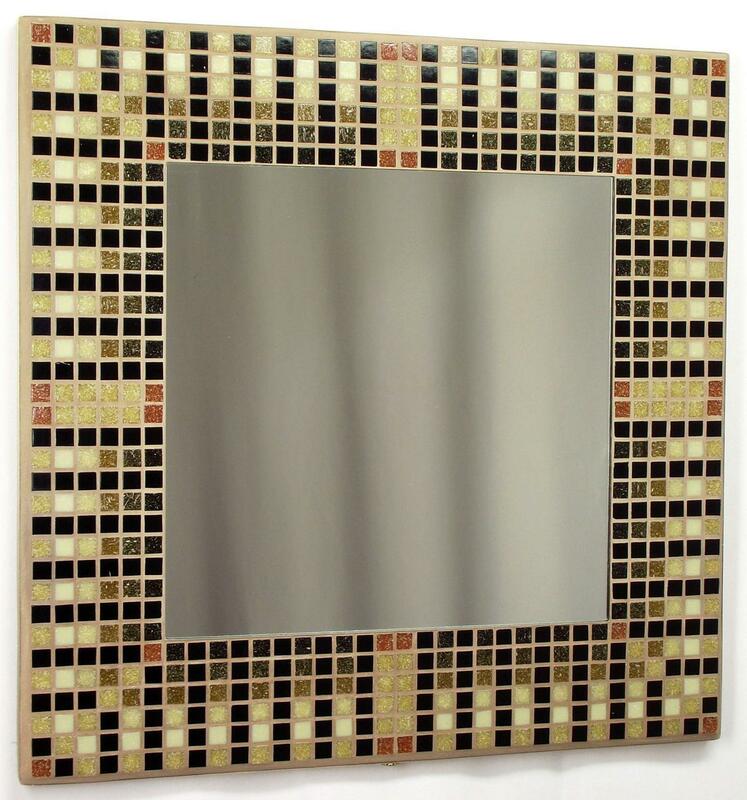 This photo shows the Egyptian Brown 38cm Mosaic Mirror, in the Satin Edged format complete with Stand. Black tiles, six graduated browns and a reddy-brown highlight tile with a light brown grout. This pattern of black stripes interspaced with coloured graduations and highlights is inspired by the 'Nemes' striped headdress of the Eqyptian Pharoahs. This mosaic design is Copyright © 2015 Kaamar Ltd.
Wall hang or use optional stand. Mirror Size: 24cm x 24cm approx. Grout Colour: Light Brown 15BRW. The Satin edged version of this mirror has satin wrapped around the edge of the base board for a softer look. The satin is secured with a decorative brass pin and adds colour and sheen (suitable for dry areas only). Prefitted with brackets and picture cord for easy wall hanging. Ensure wall fixing can safely take mirror weight. Overall Size: 381mm x 381mm x 22mm approx. The Satin edged version of this mirror has satin wrapped around the edge of the base board for a softer look. The satin is secured with a decorative brass pin and adds colour and sheen (suitable for dry areas only). The stand allows the mirror to rest on a table or other surface, coming prefitted with a hinged painted stand, brackets and chain. The chain can be reduced to adjust the mirror stand angle. Overall Size: 381mm x 381mm x 31mm approx (with stand closed). We have tried hard with our photographs to capture the mosaic colours. Even then, the colour you see on your screen may not be exactly the same as we see on our screens, due to differences in browser, display and screen settings. As with all mosaics, the artistry is in the overall mosaic impression, rather than the specific use of colours. Mirror Glass is hand cut (with sharp edges removed) which can give irregular shapes and edges and even tiny patches of edge damage to the mirror backing. It is almost inevitable that the many physical processes involved in cutting, mounting and tiling the mirror will result in imperfections on the mirror glass such as small scratches: where possible these are polished until barely noticable. 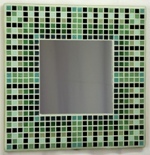 While this product is usually 'Made to Order', as one example of a fully customizable mosaic range, sometimes we choose to pre-make some items so we can offer faster delivery. Currently we have limited supplies of this product available 'In Stock' - once supplies have been used up, this product will be 'Made to Order' (unless we choose to make more for stock). If you are a consumer, you have the right to cancel an order that contains only 'In Stock' products under The Consumer Contracts Regulations 2013. In such cases, you must notify us of the cancellation by letter or email within 14 days after delivery. You will be required to return the goods at your cost within 14 days. Standard Delivery is Free to most of the UK including remote areas and Northern Ireland, with the exception of the remote island postcodes: IM, HS, ZE. For delivery to other countries, to the excluded remote areas or if you require additional delivery options such as Saturday/Next Day/Before 10am please order online at Egyptian Brown 38cm on Kaamar.com. 'In Stock' typical dispatch: 1-2 working days, 'Made to Order' typical dispatch: 3-4 working weeks. Typical transit time: 3-5 working days. This product was added to our catalog on Wednesday 02 December, 2015.